Looking to add some magic to your summer? Opening a book can transport you to another world, an adventure, a mystery, or it can simply give you some good belly laughs. I’ve spent a number of months conversing with people of every personality type to find out what kinds of books they enjoy. It has been a fascinating time! I’ve learned that sensors like fantasy and science-fiction books just as much as intuitives do, and that probably 60% of authors are INFPs (that may be an exaggeration, but it seems like it!). So without further ado, here’s what you should read this summer! And you never know, you may like ALL of the books on this list! (I do, and I’m an INFJ). Victoria Jones has spent a lonely childhood in a corrupt foster-care system, moving from home to home, unable to get close to anyone. At 18-years-old she is emancipated from the system and lives in a public park, where she plants a small garden of her own. She understands the Victorian language of flowers and knows which flowers will bring grief, signify mistrust, or embody solitude. Through a series of personal hardships and heart-wrenching struggles, Victoria uses her knowledge of flowers to help others and to unravel the mystery of how she came into the world. J.R.R. Tolkien captures warfare, survival, and courage in a way that only an INFP can. His epic stories tell the tale of young Frodo Baggins, who finds himself faced with the immense task of destroying the One ring of power. He must leave his home and make a perilous journey across Middle-Earth to the Cracks of Doom, to destroy the ring and defeat the Dark Lord Sauron. Ready for a mind-bending adventure both terrifying and magnificent? Alex Garland’s The Beach is just the thing. The Beach tells the story of a young backpacker, Richard, who travels to Bangkok where he meets Daffy, an elderly traveler who kills himself and bequeaths him a mysterious map to a hidden beach. This beach is the stuff of legends among other young travelers, and it has been turned into a communal Eden by a small community of International travelers. At first glance, the Beach appears to be a utopia, but as time goes on Richard discovers there are deadly undercurrents and troubling secrets hiding in the community. Seveneves is a science-fueled saga that begins with the destruction of the earth’s moon. This destruction sparks a meteor shower that is dubbed “the Hard Rain”. This shower will bombard earth for thousands of years, destroying all life on the planet. Humanity has only two years to get off the earth and into the Cloud Ark, a group of small, quickly built spaceships that will house millions of the Earth’s inhabitants. Who will go and who will stay? How will the survivors outlive the lethal conditions of space? Will the internal politics in the ships destroy all hope? Seveneves is an epic story of humanity and surviving against all odds. Considered “the finest spy story ever written” by novelist Graham Greene, The Spy Who Came in From the Cold tells the tale of Alex Leamas, a British agent in early Cold War Berlin. Leamas is in charge of keeping double agents undercover and alive, but East Germans start killing them. As a result, Leamas is called back to London by his spy master where he expects to be fired. Instead he’s given a terrifying assignment: play the part of a disgraced agent, a complete failure that everyone talks poorly about. He’s sent deep into Communist territory to trap the Germans in their own game. This thrilling non-fiction book synthesizes dozens of political, philosophical, and religious texts spanning thousands of years of warfare to provide tactics for defeating failure and negotiating from a position of strength. Author Robert Greene gives us a guide to the social game of life by using ingenious and effective military principles. You’ll learn lessons from a variety of people including Napolean Bonaparte, Shaka the Zulu, Samurai swordsmen, movie moguls, and more. He’ll use these examples to give you clear strategies to win life’s wars, avoid unwinnable wars, and respond to dangerous situations. You’ll learn how to overcome self-defeating patterns and forever gain the upper hand in business and conflict. Chuck Palahniuk brings a world of anarchy and angst to life in a book that points a finger at materialism, corporate power, and greed. The narrator of this story leads an empty existence investigating accidents for a car company in order to assess their liability. He’s an insomniac who feels isolated and bored. After crossing paths with the nihilistic Tyler Durden, the two friends form “fight clubs” across the country where thousands of young men fight each other “just as long as they have to”. Durden harnesses the despair, alienation, and violence he sees into a complete anarchy culminating in a terrorist attack full of bizarre plot twists and surprises. This book is outrageous, hilarious, violent, and thought-provoking all at the same time. I read this when I was 16 and it changed my life; I gave it to my ENTP brother and he couldn’t put it down. What Do You Think? Do you enjoy these books? What are your recommendations? Let me know in the comments! Well that’s it now, I’ve always meant to tackle the divine comedy (INFJ) looks like I must get on with it now. Lovely idea – well done! I have read several of the books on this list, and will definitely look into acquiring the rest! Thanks for the suggestions! I am a female INTP/J , and absolutely loved the Outlander series by Diana Gabaldon. No, I am not talking about the bodice ripper TV series. The books are full of depth and detail, and quite the imaginative journey if you’re up for 8+ books, each weighing in at over 900 pages. I do intend to dig into Dante at some point, and Brave New World, and thanks for the heads up about Seveneyes, I guess I should give that a try if I ever find time to read. One for you, have you ever read any of the works of Ursula Le Guin? I think you will love her, from the way she writes I strongly suspect that she types as an INFJ. I completely lost my MIND when I saw ENTP’s book was Fight Club!!! 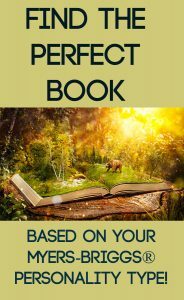 It was great to know what kind of books each type prefers and I was surprised to see the ISFJ book would surely be the sort of story my ISFJ mother would like to read. Thanks so much for this post, Susan! I’m such a bookworm so it totally made my day.